The S&P 500 is an American stock market index based on the market capitalizations of 500 large publicly traded companies; S&P has begun measuring the green bond market more recently. More recently, a national energy firm was placed on CreditWatch due to liquidity issues as a result of a strike by employees in 2017. This led S&P Global Ratings to revise the company’s liquidity assessment from "adequate" to "less than adequate," signaling the potential for a multi-notch downgrade. Both of these are examples of negative credit actions resulting from environmental, social or governance (ESG) risk. Unmanaged ESG risk can have a material negative impact on credit quality, but there are also environmental and social opportunities to be seized by companies that implement strong risk mitigation strategies and demonstrate effective management. "technology risk," relating to the significant impact that technological improvements supporting an energy-efficient economic system can have on organizations. Recent S&P Global Ratings research found that, from mid-2015 to mid-2017, E&C risks and opportunities featured in 717 of 9,000 ratings actions (when a rating is either raised or lowered, when an outlook is revised or when a rating is placed on CreditWatch). This is a noteworthy portion, given the high number of risks that can affect credit quality. Moreover, of these 717 references, 106 listed E&C risks or opportunities among the key reasons for a rating action. However, although most updates resulting from E&C factors remain negative, E&C factors in this research exercise were more likely than before to prompt a positive ratings action. Out of the 106 actions, 44 percent were positive and 56 percent were negative — a contrast from the previous two-year review, conducted in 2015, in which 21 percent were positive and 79 percent were negative. Out of 106 actions, 44 percent were positive and 56 percent were negative — a contrast from the previous two-year review in 2015, in which 21 percent were positive and 79 percent were negative. This could indicate that companies are mitigating E&C risks more effectively than before and embracing new opportunities — although other explanations are also possible. The credit analysis also elucidated that physical risks — above all other E&C risks — have been most material to credit ratings, with more than 40 of the 106 cases citing E&C risk as a material contributor to a rating action being related to physical risk (Figure 1). Physical climate risk can be split into two categories: acute and chronic. The former refers to event-driven physical risks, including the increased severity of extreme weather events such as cyclones, hurricanes or floods; whereas chronic physical risks refer to longer-term shifts in climate patterns. Both types of environmental risk can and do have an impact on corporate credit quality. However, it is important to note that factors extraneous to climate change also may play a role in weather events. While we know that climate change increases both the incidence and severity of adverse weather events, such as hurricanes and droughts, it is more difficult to determine whether climate change is the direct cause of a specific weather event. For this reason, S&P Global Ratings considers all forms of E&C risk. Identifying the social factors linked to complex and dynamic interactions between a company, its stakeholders and the broader society is no easy task. 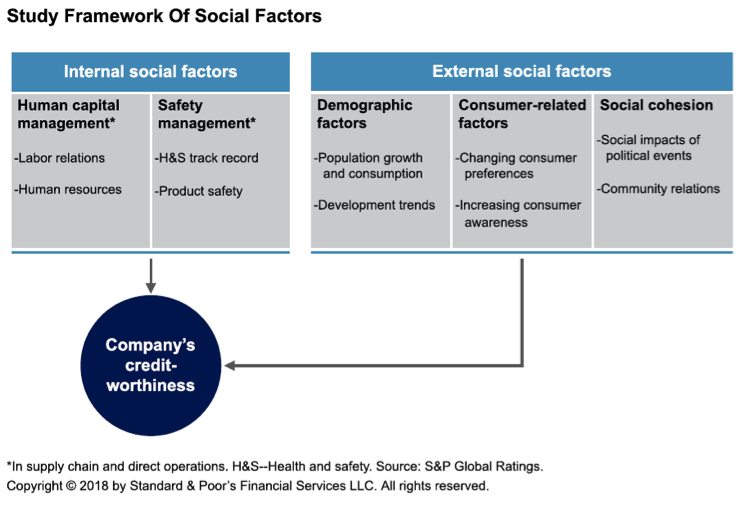 S&P Global Ratings has identified two main categories of social factors relevant to our corporate credit ratings: internal social factors and external social factors. Those that relate to a company’s management of human capital and safety are internal social factors and include the company’s capacity to develop a long-lasting productive workforce, its vulnerability to strikes and its track record on product safety. External social factors refer to a corporation’s exposure to external social trends. These comprise changing demographic factors, consumer behaviors and social cohesion, which can include community unrest and terror attacks. By their nature, external factors are less within the company’s control than internal factors. S&P Global Ratings’ research found that from mid-2015 to mid-2017, there were 346 cases in which social factors were explicitly identified as relevant to a corporate or infrastructure rating. In 42 cases, social factors — both event-driven and those occurring over a longer time period — resulted in a change to the rating or outlook or a CreditWatch action. And while S&P Global Ratings noted that social factors contributed less frequently to ratings actions than E&C factors, when social factors were material, they were overwhelmingly negative to credit quality compared to E&C factors. In 42 cases, social factors — both event-driven and those occurring over a longer time period — resulted in a change to the rating or outlook or a CreditWatch action. This doesn’t negate the possibility of credit changes in the positive direction, however. Last year, a travel firm’s outlook was revised to positive, for example, under the "social cohesion" category (Figure 3). This outlook revision reflected resilient operating performance in 2016, despite disruption in a number of its markets resulting from terrorist attacks, which required substantial redirection of capacity to safer destinations at short notice. With climate change and severe weather events receiving more attention — from the media, the public and central governments — financial market participants are becoming increasingly concerned about all aspects of E&C risk. Along with other market developments that focus on awareness of social risks, this is encouraging more comprehensive levels of ESG disclosure. Indeed, ESG risks and opportunities are relevant to the creditworthiness of rated entities across multiple sectors, but the materiality and visibility of those factors can differ by entity, industry and country, and they can change over time. Ultimately, increased understanding of ESG factors and enhanced ESG disclosure by companies could make the further incorporation of ESG factors into credit ratings more consistent and transparent for all sectors.